The NCAA men’s basketball Final Four is this weekend, and downtown Minneapolis has transformed into the center of the college basketball world. Street banners and signage already line the streets, a 90-foot Ferris Wheel stands at 10th and Nicollet, a 3-dimensional March Madness bracket stands at 8th and Nicollet, and more festivities and fun will line the streets throughout the weekend. With more than 90,000 people expected to attend the events, the NCAA and Minneapolis Local Organizing Committee have teamed up to provide information as part of their Know Before You Go initiative. Whether you live in the Twin Cities, are driving in regionally or flying in for the big games, the Know Before You Go initiative is aimed to help you plan your trip. 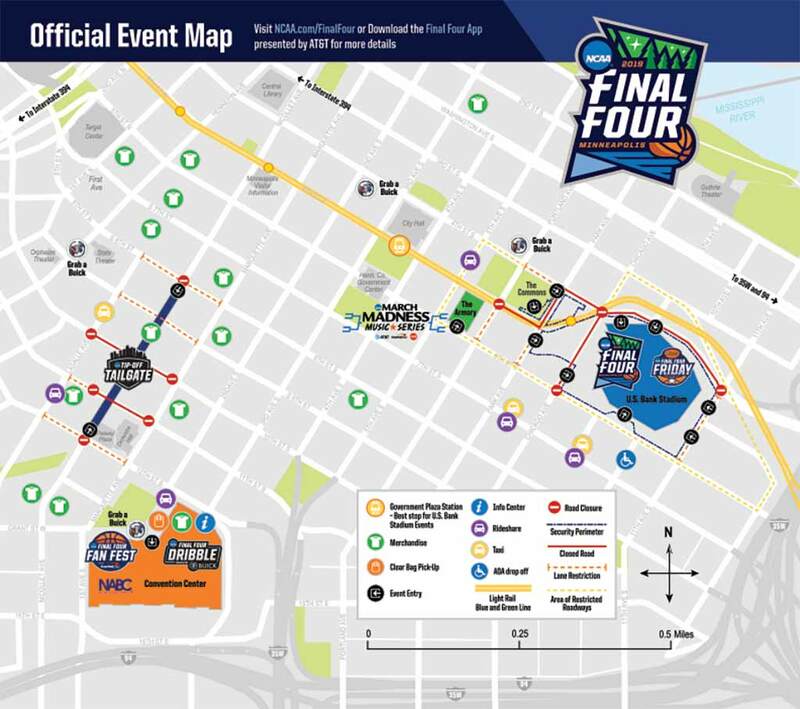 Download the Final Four app–full maps, schedules, appearances, and more! Visit finalfourminneapolis.com for full information, Metro Transit, maps, etc. Clear bag at every event: The festivities have a clear back policy. Bring your own or pick one up at one of several locations downtown. Be prepared: Follow along with announcements and information on the website or app listed above. The Mpls Downtown Improvement District’s Ambassadors will be out and about throughout the weekend helping you get around with any questions you may have. Feel free to stop, say hello and ask any questions you may have. They will be wearing their lime green polos or blue coats throughout the weekend, and they can also direct you to any printed maps to help you navigate. Take some time to get to know our city–here are a few ideas of places to check out while you are here. As you navigate downtown Minneapolis, use the following map below (or print a version here) to find food, coffee shops, bars and more.